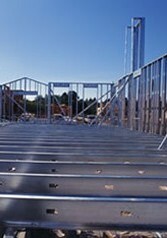 O'Donnell Steel Co. has the steel that is required for your construction project. Choose the metal your need from our steel distribution company in Cleveland, Ohio. Your basic steel is hot rolled and coiled. This is a great product for a variety of uses on your construction fields such as for welding. Reduce and flatten the thickness of your product down to a sixteenth. When this is done, you have a more precise part with a tighter tolerance. The basic steel is put in an acid bath and coated in oil. This process is done to protect the metal from corrosion. This product is ideal for your construction projects and it gives your final build a nicer looking appearance. Our galvanized metal is dipped and coated in zinc. Coating the material in zinc is a corrosion resistant measure that protects the base metals from carbon exposure. Contact us to learn more about the variety of steel products that are available for distribution.